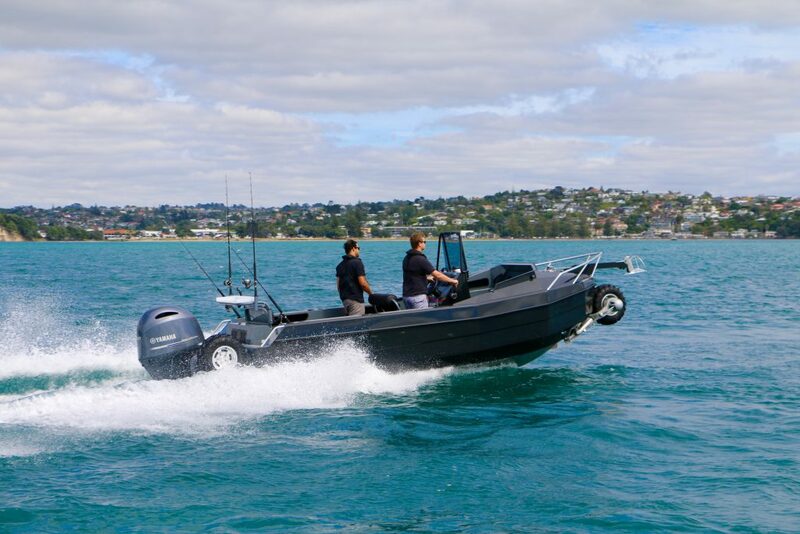 Auckland, New Zealand; Kiwi boat builder, Sealegs International has released its newest amphibious craft, the 7.7m Sport D-Tube. Designed and built in-house by Sealegs, the new 7.7m Sport D-Tube joins the company’s popular 6.1m model in the D-Tube range. The new larger model set to appeal to those who want more volume in their amphibious craft, coupled with additional features to make it an all round and capable fishing machine. Fishermen will love the open layout of the 7.7m Sport D-Tube. The ability to navigate to the forward area around the helm console and the high cockpit sides will allow anglers to play that large fish confidently and securely. Features include cockpit side shelf storage, six rod holders in the coamings, cupholders, a bait board, fore and aft passenger seating and a spacious dash able to accommodate up to 12” multi function displays. A bimini or a T-Top is available as an option providing extra protection from the elements. The placement of the inboard powerpack on the transom allows for additional under-seat storage beneath the helm seat. The 7.7m Sport D-Tube measures in at 7.8m in length overall with the wheels up, and has an external beam of 2.26m. The 5mm aluminium hull has a 21 degree deadrise, and features six aluminium chambers making the craft very stable, buoyant and virtually unsinkable. Like all Sealegs craft, the 7.7m D-Tube is powered by Sealegs patented Amphibious Enablement System, or AES. The AES, including a fully marinised system of hydraulically powered legs and wheels, is powered by a marinised 22HP inboard engine. The fully integrated, turn-key package uses the same fuel source as the outboard, and is simple to learn and engage. Designed to be rapidly deployed, the 7.7m Sport D-Tube can be driven from a storage location or trailer, down a launching ramp or beach and into the water – all with the occupants staying in the boat and remaining completely dry. The 7.7m Sport D-Tube will appeal to fishermen who want to access remote and shallower waters, using the Sealegs system to navigate their way to the desired spot no matter what the tidal condition. Powered by a 200hp Yamaha four-stroke outboard motor, the 7.7m Sport D-Tube will achieve 38.5 knots, and the 21 degree, 5mm aluminium constructed hull is rated from 150hp-200hp outboards. “Our new 7.7m Sport D-Tube was developed in response to international sales demand. Customers loved the 6.1m D-Tube, but they were wanting something bigger, with more space and more features. The initial response has been fantastic and the new model is now in full production,” says McKee Wright. Built to the demanding standards of CE and USCG the 7.7m Sport D-Tube encapsulates the best of Sealegs technology in a rugged and agile package. From its factory in Auckland, New Zealand, Sealegs has built over 1,100 craft, sold to over 50 countries in 12 years. High resolution images available to download here via drop box.